A walk in the woods cost me $6.75 admission today. 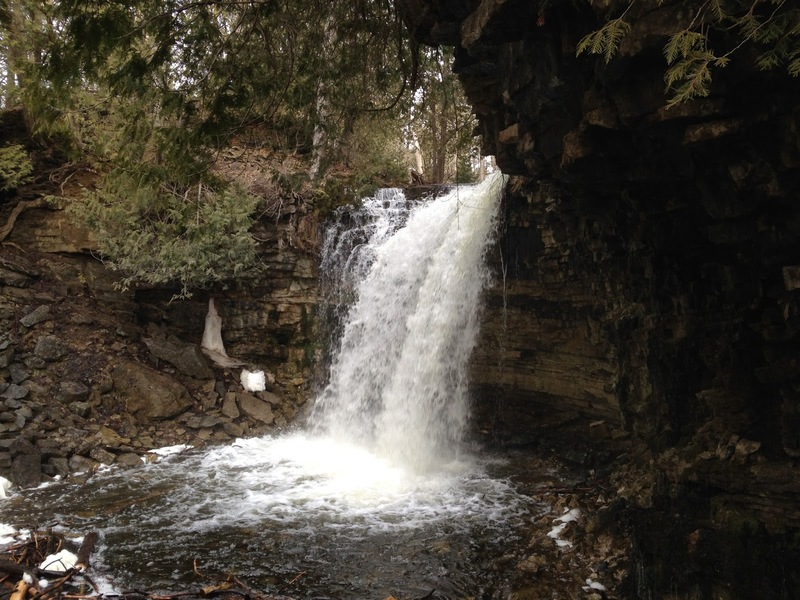 The woods in question were at Hilton Falls Conservation Area, along the Niagara Escarpment near the city of Milton. I walked through a beautiful mixed forest of oaks, beech, birch, and a sprinkling of conifers. There were a few stands of red pine planted in uniform rows forty years ago, but for the most part it appeared to be natural regeneration, the original forest having been cleared out by European settlers in the nineteenth century and logged over a couple times thereafter. The park is named for one of those early settlers, a man named Hilton who built in the 1830s a sawmill at a small waterfall that now bears his name. The 33km of trails in the park are maintained in superb condition and are clearly signposted. There are useful interpretive sites along them, explaining how things like vernal pools are essential for many of the park’s native species, including the Jefferson salamander – a protected species here in Ontario. Indeed, I learned there are several protected or endangered species living in the park, including the Redside Dace (an endangered minnow) and the Eastern Milk Snake (not yet endangered, but officially designated as a ‘species of concern’ (i.e. 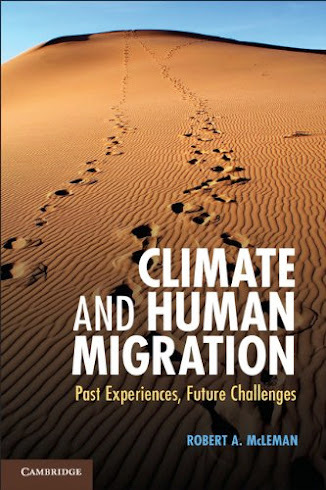 on the path to becoming endangered)). What they all have in common is a need for habitat that is relatively undisturbed by humans, something hard to find amidst the sprawl of metro Toronto and creeping suburbs like Milton. The highlight attraction of the park – the falls – are very pretty, as you can see from the image above. There are steps and viewing platforms above and below the falls, and plenty of signage to explain their history. There is also a fire pit with permanent group seating around it. 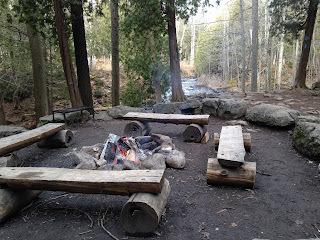 When I arrived, there was a beautiful campfire burning away, evidently built by park staff first thing in the morning. Several cords of neatly split, dry wood were stacked in a crib nearby. I got a lot for my $6.75. I saw and heard lots of different bird species, admired the scenery, enjoyed the fresh air, and had the place almost to myself. I sat at the fire for the better part of an hour, listening to the crackle of the fire and the sound of the falls, and saw not another person. In my whole time in the park I encountered seven other people: three separate retired couples and a woman roughly my age. All were attired like the people in a Patagonia ad. I did not see a single kid until I got back to the parking lot and its handful of cars, where I saw a family of four about to start out for a walk. The lack of kids in the park troubled me. Today is the first Sunday of the week-long break all Ontario primary and secondary schools take each March. It was unseasonably warm, under clear skies. Granted, I was there in the morning, and it is the first day of daylight savings time, so a lot of people might have been slow to get out of bed today and planned to hit the park in the afternoon. Nonetheless, the absence of families was conspicuous. When I was a kid in the 1970s, my family (six of us in all) regularly visited Hilton Falls. I also remember snowshoeing there with our school’s ‘Outers’ Club’ in grade three. There was no admission fee in those days, just a parking lot. The trails were rougher then, and there was no shop selling drinks and ice cream as there is today. On weekends, the place was crawling with families. Literally, crawling: there are all kinds of old caves in the limestone that we would crawl through, and we would spend ages scrambling around the cavity behind the waterfall. Today, visitors are kept away from those caves, and I suspect that frolicking in the falls is also discouraged. But even with these restrictions, it is still a fantastic place to take the kids – if you can afford it. The main reason my family went there so often was because it was free. For parents trying to raise four kids on a modest income, a trip to that park and a picnic lunch by the falls was a cheap and fun outing. Admission for a family of six today costs $33.50. Even adjusting for inflation, had such fees been in place when I was a kid, we would have never, ever visited Hilton Falls. I wonder how many families didn’t take their kids today to Hilton Falls or other natural parks because of the admission fees? I don’t blame the Conservation Authority that operates the park for the steep admission charges. They have a relatively small number of revenue streams, user fees being one of the few over which they have full control. * They are also following the lead of the provincial government, which manages Ontario’s provincial parks on a cost-recovery basis. Park gate fees provide up to 80% of Ontario Parks funding, and the government hopes this will eventually reach 100%. The outcome is that it’s increasingly difficult for Ontario families to visit relatively natural areas without having to pay for the privilege.. As with so much else in our society today, access to nature is becoming increasingly segregated into haves and have-nots. 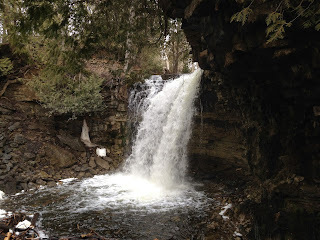 People like me who can afford the entry fee can get a first-rate nature experience at a park like Hilton Falls, assuming they haven’t gone off to the cottage in their SUV or jetted off somewhere for a March break vacation. For everyone else, at least the city parks are still free, and you can get to one by walking or taking the bus. And with any luck, it might have a woodlot or some other scrap of somewhat natural space, though most don’t. It is therefore not surprising that attendance at national and provincial parks in Canada is declining. It is also not surprising that Canadian children spend no more than a few hours a week out of doors, or that child obesity rates are rising. I’m ok with governments implementing user fees on lots of things, but day-use access to parks is not one of them. Our public spending priorities are wacked. It cost me $6.75 to use the public trails in the park, but I was charged nothing to use highway 401 to drive there. If we lack money to maintain parks but don’t want to fund these using general tax revenues as we do other basic infrastructure (like the 401), we need to find other ways that don’t discourage park use or limit access to the relatively well-heeled. For example, we might instead collect the money via a surtax on the cottages that monopolize and exclude the public from so many of Ontario’s waterfronts. Or implement a horsepower charge on automobiles like in Europe, where you’re free to drive a gas guzzler if you like, but you’ll pay extra taxes for the privilege. I was fortunate to have grown up in a time when working class and lower income families had cheap and easy access to brilliant places like Hilton Falls. While I greatly enjoyed the serenity of the park today, it would be much better for everyone if those woods were as full of shouting kids as they are birdcalls and the sounds of rushing water. *Southern Ontario’s Conservation authorities are quasi-government agencies responsible for managing waterways and many publicly owned natural areas, and are operated on a not-for-profit basis. They receive half their funding from municipal property tax levies. A fire by the falls.